Over the past week or two, many of our clients from Leicester, London and Stafford have been asking us about the impact of what has been dubbed ‘Mobilegeddon’. The media have really blown Google’s latest algorithm change out of proportion and many web designers and developers have used it as a scare tactic to push some businesses into spending huge amounts on new mobile friendly websites. So what is the truth about Google’s new mobile friendly algorithm? A couple of weeks ago, Google told us that they will change their search engine algorithms to give better placement to mobile friendly websites. These are websites that adapt to the size of your mobile phone or tablet screen. A large percentage of websites simply are not. A simple way to tell is to use Google’s test page at https://www.google.com/webmasters/tools/mobile-friendly/ . Will Your Website Drop Out Of The Search Engines? This is very unlikely. Google’s algorithms take thousands of factors into consideration when deciding where to place your website in the search engine rankings. Mobile friendliness is just one of these many factors. How Significant Will The Mobile Friendly Algorithm Be? Google have tried to reassure website owners that this won’t be an “earthquake which turns their websites upside down but quite a subtle evolution”. There are many high quality websites owned by large organisations and household names that are not yet mobile friendly. Google’s goal has always been to get the highest quality results to the top of their search engines. Their last two updates, Panda and Penguin, impacted search results by about 13% and 4% respectively. When asked about the impact of the new mobile friendly algorithm, a Google representative responded “we have nothing to share about this at the moment… wait and see”. If Your Website Isn’t ‘Mobile Friendly’, What Should You Do? The worst thing you can do is panic! Over the next couple of days, we will start to see how big or small the impact of this latest change will be. So monitor your website’s placement on Google and Google Analytics, looking out for any changes. It could be that the change has little or no affect on your site for the time being. Another important question to ask is how do your potential customers find you? Do they use desktop computers or mobiles phones and tablets? This can easily be found by logging into your Google Analytics account. The new update is likely to affect only those searching through mobile devices. There are two options to consider. 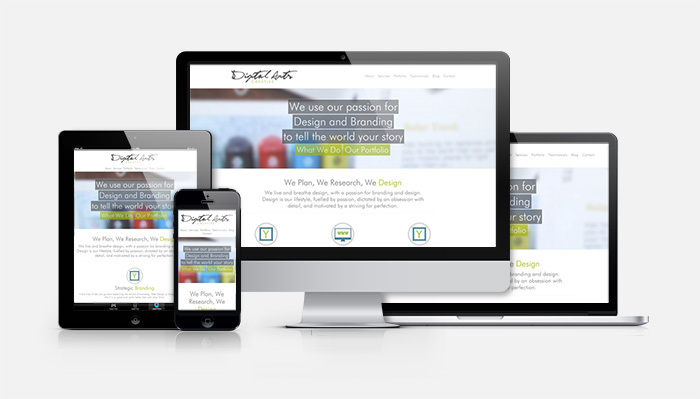 The first is a responsive website. This is where the website shrinks and moves to fit the width of your screen. To see an example, make your browser window smaller and notice how content on our website moves and shrinks (or see the image below). The other option is creating a separate mobile website. When your homepage is accessed, your website sends mobile users to mobile version of your website. This usually comes up as something similar to m.yourwebsite.com . Which option is better? Responsive website are by far the most future proofed option. It also means you only have to update one website rather than two and it adapts to fit a range of device sizes rather then just a mobile and standard desktop computer. The only downside is that responsive websites take far longer to create and thus cost more money. Need Help Making Your Website Mobile Friendly? If you decide to make your website mobile friendly, we would love to help. We can advise you as to whether or not you need a new mobile friendly website, how this can be done and the potential costs. Feel free to give us a call or drop us an email via our contact page. As mentioned above, this article is from back in 2015. Our latest advice is to try and move across to a mobile friendly websites as soon as possible.